With great emphasis on person-centered care and patient-centered care, LifeBio has now added a new "About Me" format to its online biography system that generates I Care Plans. This About Me short bio creates a personalized I Care Plan document that captures background, activity preferences, and lifestyle preferences. Here are three tips for creating an excellent I Care Plan. Ensure the language is written in a "My" or "I" formatted way for staff or loved ones to read later. It helps to see the person more holistically when the story of their life and their background is presented in a person-centered way during I Care Planning. For example... My favorite foods are rosemary chicken, and I also love peanut butter and jelly. One thing that I've always wanted to do that I've never done is....ride in a hot air balloon. Here's some background on the work I have done in my life...I worked for the fire department for 30 years. Make certain the personalized information is as readily available as possible in health care and senior care settings. An excellent solution is to have the "I" Care Plan accessible from with the electronic health record system. Now a nurse or other care worker can get familiar with the person -- with text and photos -- very quickly and improve the patient experience. Example: LifeBio generates an instant PDF file after someone has created an "About Me" quick biography in the system--and these can be easily uploaded into EHR software. You can always generate these without the last name showing if you have permission from the person to print and display this as part of delivering excellent service and care. 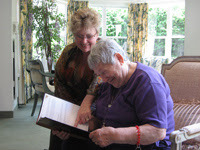 Use the information in I Care Plans to enhance people's lives. It's important to know the collection someone had enjoyed for many years. It's important to know where they grew up and perhaps things you have in common. It's important to know people's values and beliefs --LifeBio's About Me format inside www.lifebio.com takes the conversation deeper. It's important to build fun things to do around what people love to do! No matter what - -make sure the profile of the person is not just gathered and then filed away somewhere. It's being gathered so it can be used to build a great relationship, to garner respect, to support someone as they reach end of life, and to bring joy and happiness in daily life experiences.